Our day starts early with a fresh meal prepared daily by local Haitian women. Quick last minute preparations are in order. After packing snacks for lunch, lathering on sunscreen, grabbing our gear, and saying a prayer we are ready to go. In order to get to see the Elders we must first take a 45 minute drive in the "Tap Tap," to the village where they live. For those unfamiliar with Haiti, the "Tap Tap" is basically a truck with a camper shell type structure in the bed of the truck. It has 2 long benches in the back and multiple loops hanging from the ceiling in which is you can attempt to balance. If you are really feeling it, you can try "Tap Tap Surfing," which means you stand up and with no hands attempt to balance as the Tap Tap goes bumping down the more-often-than-not, unpaved road. The drive brings perspective to the poverty and devastation to the country. The Haitians continually burn their trash and the smell of the fires takes some getting used to. By the end of the 45 minute drive your hair has collected so much dust from the ride that your hair feels like straw. The sites, smells, and sounds are new and overwhelming for those who have never experienced Haiti before. The needs varied from Elder to Elder. We found that the biggest need often stemmed from living conditions. The places that our Elders call home look like what an American might call a make shift shelter. They are small and made from a combination of cinderblock, tarp, plywood, and basically anything that might hold 4 walls and a roof together. Many of our Elders asked for help repairing their homes or helping them move. Our Elders lives are difficult and it is starkly different from the average aging American. 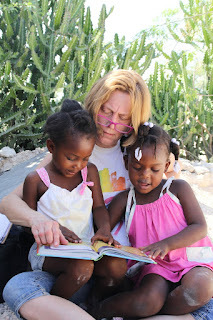 They usually only eat the meal that Grace Village brings them 1x a day---like a Haitian "Meals on Wheels"---as they are typically physically unable to provide for themselves. HOWEVER, and this is a BIG however....These Elders have many things Americans do not. They have a reliance on God that is pure and beautiful. When asked if they feel safe or if they are sad about anything all of their responses looked something like, "With God I feel safe," "With God I would be nothing," "With God I have peace." And the craziest, goosebumpiest, (I know that isn't a word) part is that they say these things with true trust in their eyes and smile. They say that God is enough for them as they sit on the one and only chair they own, wearing well worn shoes. And they gladly pose and smile at our camera for one of the few pictures they will ever have taken of them. Since we have been here 95% of the Elders we met with said that their favorite Bible verse is Psalm 23! It's mentioned so often that our team is learning to say it in Creole. And despite being unable to read or write, some of these Elders have the whole thing memorized. (Please take a second and See Below For Psalm 23.) To put this in perspective... as they sit dizzy from thirst and hunger, one of the main and simplest requests they have is for new shoes, specifically fancy shoes for church, as to show respect to the Lord most high. They have nothing and yet they choose to praise the Lord with words, songs, and even shoes. I will leave you with these words and the pictures and verses that follow...the BIGGEST smiles and excitement we have been privileged to witness is the sheer joy of seeing a Children's Bible that is full of bright and colorful pictures of basic Bible stories. At one visit, one of our gentlemen quickly took the Bible and put it safely in his room. The saddest part of our day was telling him that we needed to keep it in order to share with the other Elders as we only have 1 translated Bible in Creole. For our team, it was the coolest thing to witness their faces light up and yet so sad that someone could find so much joy in a Bible and yet not be able to have one. Please be in prayer about this need for our 34 Elders. The Bibles are around $25.00 each and despite needing wound care, food, etc. the greatest need and want they have is for a picture Bible. We would love for each Elder to be able to have their own someday. Thank you for praying for us. Thank you for following our journey with us. And thank you for the grace you are having with us with our lack of updating. Enjoy the attached pictures and our Elder's favorite scripture. May it be written on your heart as it is theirs.